If attention is what you pursue, you will be noticed. 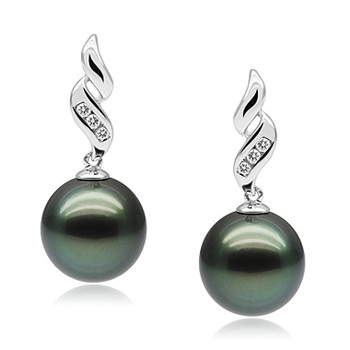 The sheer size of the 9-10mm Tahitian Black Pearl guarantees that these pearl earrings will be noticed and definitely loved for their seductive ways. The best way to be seen is with the near perfect shape and lustre. Combing those two areas with perfect nacre, you have a powerful makeup for the pearl’s surface to the smooth, silky and extremely dazzling.